oppulent luxury honeymoon personalized for your experience of manali. The curated 6 night with stay in different places each night with candle lit dinner is one of the key essene of the package. we provide a complete curated experience that start from delhi and then location sightseeing within manali and return to delhi on last date of trip. The Romantic outing gives you highest bonding with partner and memorable time and surprise gift each day to be presented to one of the lucky partner. Day 5 - Kothi , explore then kothi and its romantic spots and then we move to Kullu van vihar. Night stay at van vihar area with adventure at your end. stay can be provided in any of the suitable best in class resort or camp. Day1 - Start a fresh from delhi between 7 am to 8AM from your home airport or hotels. our latest innova crysta with carrier on top, LED Screen on back seat ready for romantic journey with you. the day one is all about start exploring the north Indian culture enroute to manali and breakfast and lunch on the way for you. After 2 Hours of journey you will reach the Murthal , Haryana. Here you can have a great breakfast with all southindian, continental and best in class north India foods all together. Murthal is popular for many dhaba and food joint however our preffered is Amrik dhaba and your table pre-booked there for the brkeakfast. Day1 - continue from murthal to chandigarh and then stop at chandigarh for a romantic launch at Virgin Courtyard . or any other restaurent that you choose within the time of booking of your trip. a 4 hours journey and then a joyful launch with partner in romantic setting is what one can expect in route. From here we start for manali straingt and we will reach at your hotel by 9Pm or 10PM. its time for a romantic candle lit dinner, our team member already informed your arrival to hotel and all arrangement perfectly set up. let move to next step and relax yourself after dinner at night in hotel or any other restaurent prfferd by you. Day 2 - Wake up in morning with full of energy for the day. After breakfast start exploring some treking , Local sigthseeing and exploring photoops manali in your memory. start from vashist bath , then hadimba temple, tibbatan monestry. after Launch start for solang valley camp cottage. a curated luxury camp for romantic night under sky with lot of fun and assured candle lit dinner awating for your lifetime memory. reach solang camp in night 7PM and then have some local jungle tracking or let relax . you romantic dinner will soon ready with lot of spice and fist surprise gift for one of the lucky partner. 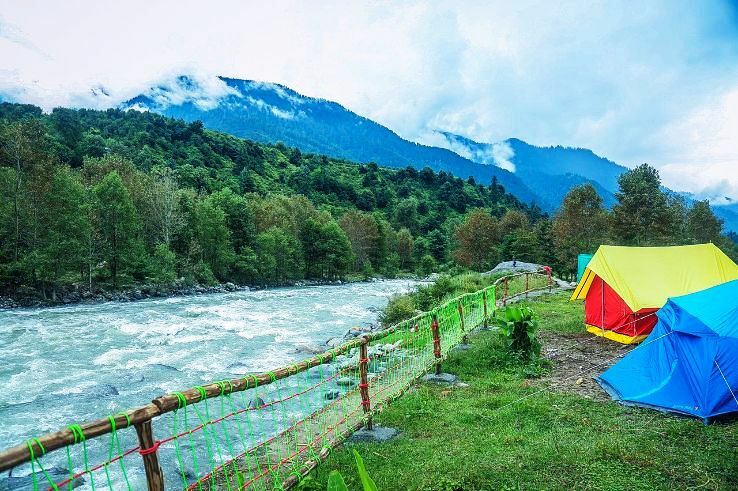 night stay at solang valley camp. Day 3 - today is a they when you have many things to do , but very less time to finish. while one side rohtang waiting for you to explore the mesmarising romand of snow. there is jogini water fall looking for some time as well. Yes forgot to mention in solang valley you can have many things to explore that bring you together and close, really close. a praagliding experience, a snow bike ride at rohtang or just river rafting to choose from. let select the best in you and go with that. while day 3 will be finish fast or very fast , you can explore further about the solang and rohtang in your memory. now the 3rd night stay will be at your next destination of Kheer ganga camp. Kheer ganga camp in kasol is memorable one and you will joy the night out with your soulmate in kheer ganga with our promised candle lit dinner at your leisure time. relax overnight and we will be move to day 4 planning while you enjoy your time. Day 4 - Explore kasol its culture and many natural beauty together. the kasol gives severla natural palces to explore and some of them will be Tosh, Malani, Kheer ganga and kasol itself. so let explore the location and then go th bhunter for a excursion of the area and then by mid of the day we will reach manikaran sahib( take a holy bath there ) in hot water kund and move for Kothi.